Saturn North-Polar Hexagon-Storm-Region with my version of false-colourization to show multiple hyper-typhoons in the Saturn stratosphere. Original image from Nasa/JPL, small gray-scale inset is earlier image from 2012. 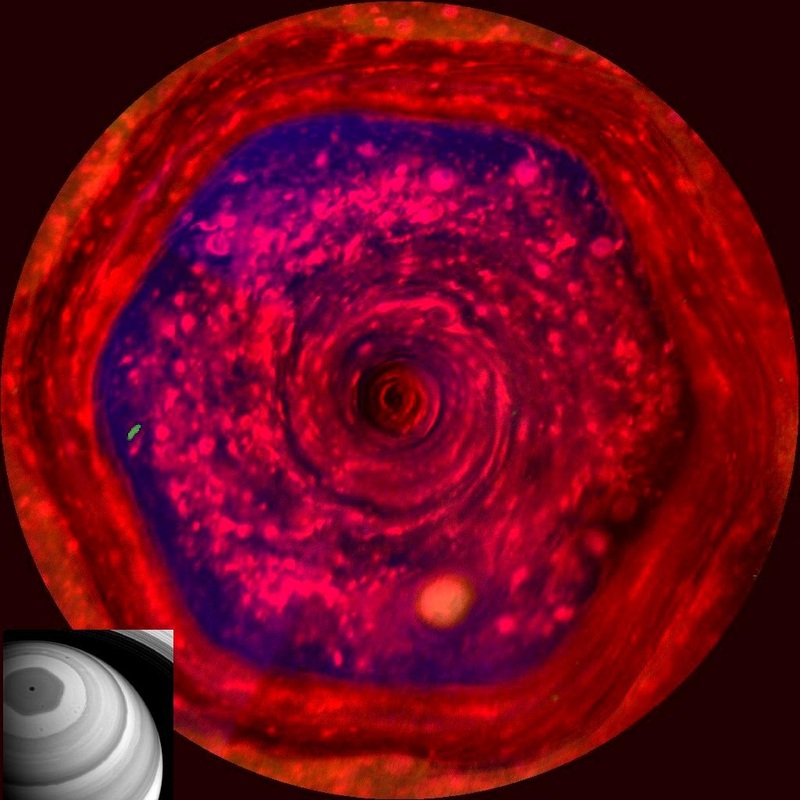 The new image shows the internal detail of the multiple storms that comprise this strange hexagon of Saturn. The blue is ultra-violet wavelength. 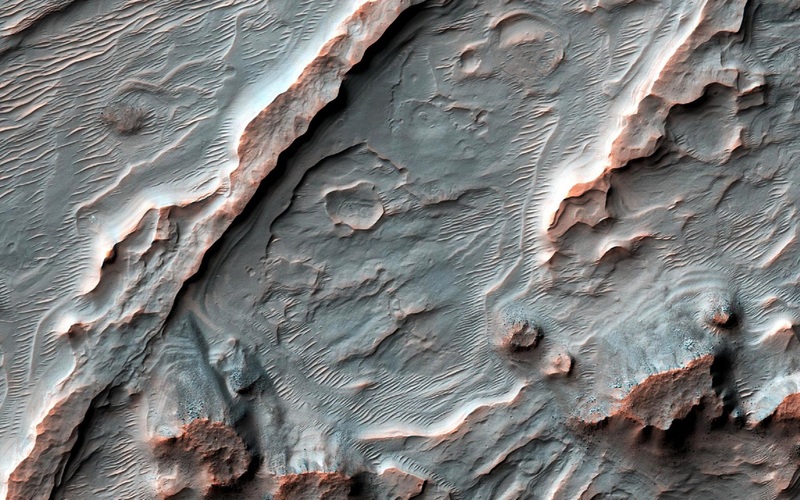 Dramatic Image of Ancient Martian Canals. These alluvial fans show evidence of ancient flowing water. They are now eroded, and stand in relief. 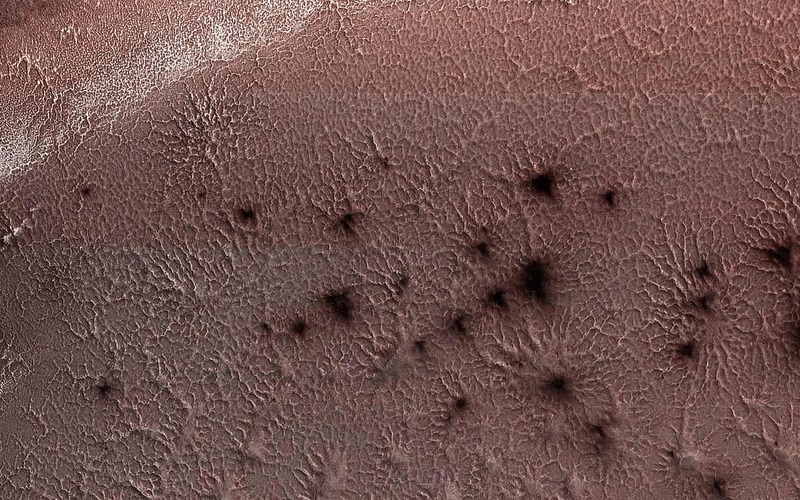 Image from Mars Reconnaissance Orbiter, March 8, 2018. 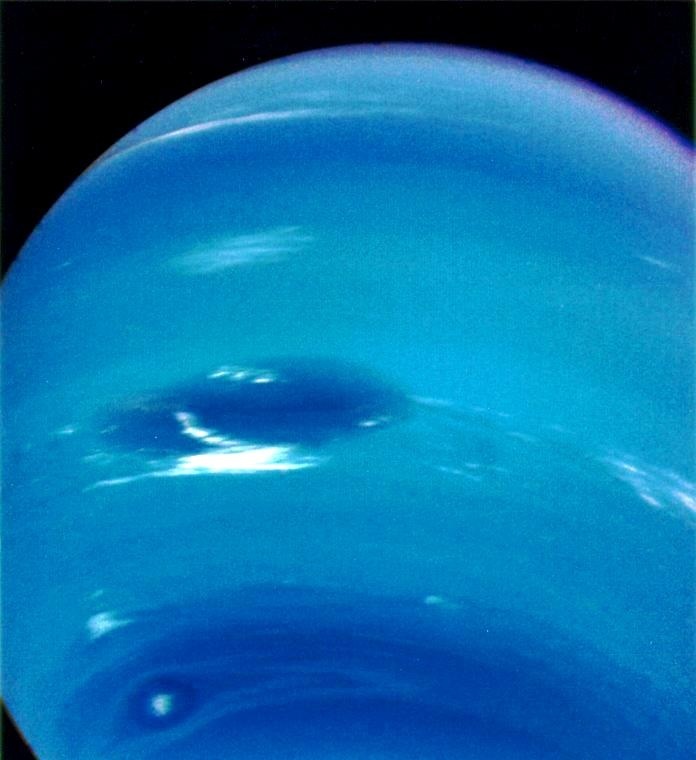 The Dual Rings of Neptune - taken as Voyager-2 was leaving Neptune, Aug. 8, 1999. 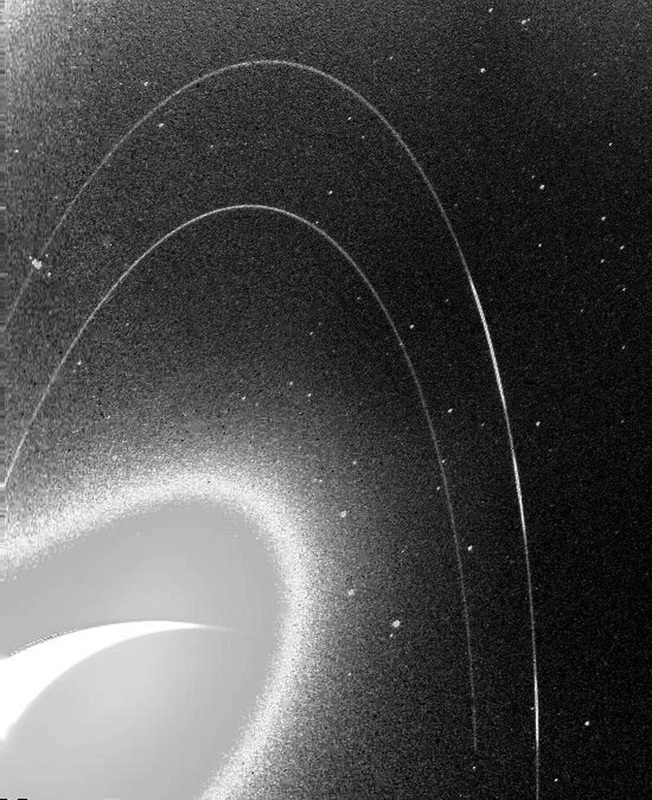 The rings are lit by sunlight behind them, and this backlighted view allowed them to be seen clearly, in this cleverly crafted image from JPL and NASA. You can see the sphere of Neptune as a bright white object, lower left. The Amazing Voyager-2 Image of Neptune, with it's Great Dark Spot - Courtesy NASA, (Image in public domain) - from Aug. 21, 1989 Voyager-2 flyby of Neptune. This is the actual image data we have (from a large radio-telescope array), of what is thought to be a "tidal disruption event" - a black-hole eating a star. At first, the 1997 and 2007 images (across the spectrum, shown in visible light in upper left) looked to be a supernova - an exploding star. But the radio-image data, from 2005, 2012, 2013 and 2015, (shown on the right, in a topological graphic), suggest that we are seeing a "tidal disruption event", which is basically a star being chewed up and eaten by a black-hole. The theory suggests that as the mass is pulled into the hole, and the atoms are torn apart, significant - and visible as radio radiation - energy streams are generated. The original article is in the June 15, 2018 issue of Science, but it is behind a paywall, and is not accessable to the people (taxpayers) who fund this research. This is *really* impressive. The Kepler Telescope has identified 2525 confirmed exoplanets - many of which are Earth-sized. The total confirmed number of exoplanets is 3567. What is particularly interesting, is that the machine-learning tool used was a TensorFlow application (very similar to MINST-type classification), which used a training set of roughly 15,000-case observations. This is a sufficiently small enough training set that the entire model can run on a desktop personal computer - total training time was only a few hours. What this shows is that machine-learning can be used to effectively to augment and extend the ability of human astronomers in a elegant and effective way, as the Kepler dataset is already large and will continue to grow. Given we have training cases where humans accurately found planets, we can apply the machine-learning tool to expand the search, and specifically focus on weak signals which are typically the kinds of signals that smaller, Earth-size planets will create. They are using logistic neurons, I notice. Their TensorFlow model will be released to the open-source community, according to the NASA press conference. Looks like very good work, which can find immediate application in other areas. 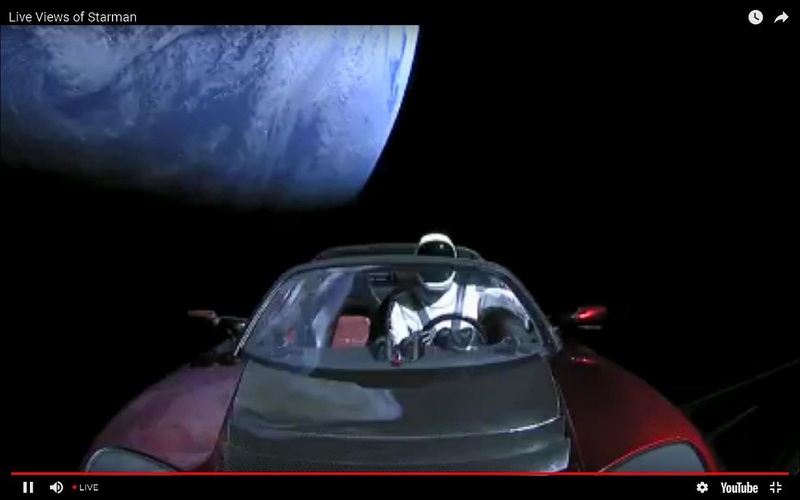 Elon Musk's Amazing Adventure - with "Starman" at the wheel of Mr. Musk's Telsa Roadster - off to see Mars! I screen-captured this *live* image, as I watched the video-feed of the Falcon Heavy first test-launch. Bravo to Mr. Musk and the whole SpaceX team! Well done, folks. You lit up the World's imagination with this successful test flight. Elon Musk was not the first guy to put a car into space. I watched this mission unfold - the last Apollo mission to the Moon. 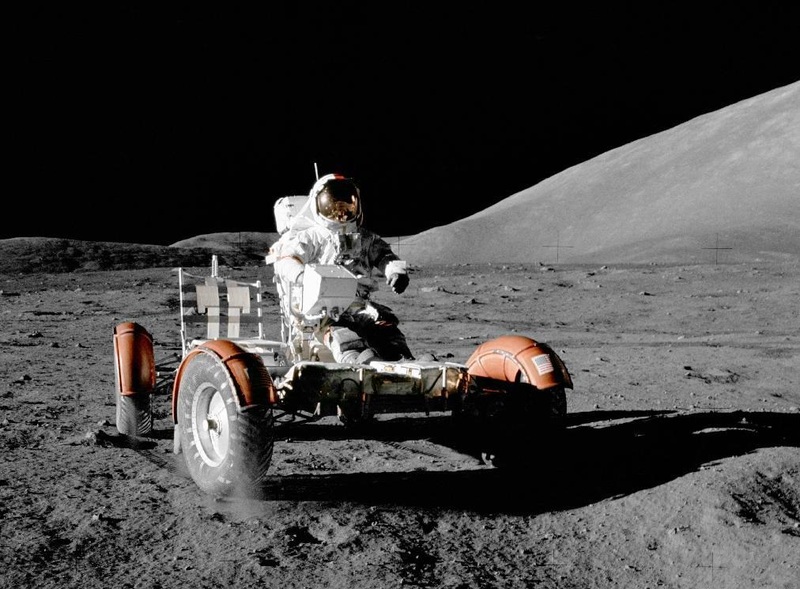 This image shows the Lunar Rover, from December 7, 1972. We had this amazing technology, but it was available for Government only, which meant when the Apollo mission was over, manned off-planet exploration just kind of stopped. 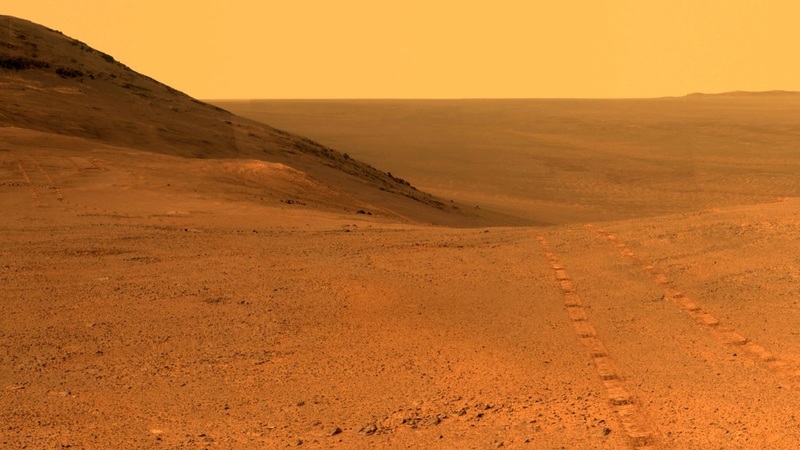 Image of Mars, taken by Opportunity Rover, Early June, 2018. Rover is silent, we are hoping as tau (sunlinght measure on Mars surface) improves we may hear a ping from it. But lets keep in mind that an entire *world* is waiting for us. The first people to reach Mars, will have a unique opportunity. If they can survive, they will become the Founders of a new world.